Salmon & Trout! Hot Tub. Deer in Yard. Very Close to River. Peace & Privacy. Just some of the reasons you'll love Sow's Ear: LOTS of recent upgrades include new living room furniture, new bedroom carpet, new hallway luxury vinyl plank flooring that's totally waterproof and major kitchen enhancements. More reasons: Great fishing access, hot tub overlooking the Trinity River (about a minute's stroll from cabin), end of the road quiet. Furnishings include cool antiques as well as a new tapestry wildlife couch and matching chair that are a delight to cuddle up on. There is a very pleasant covered porch with nice seating, a bit of river view, room to dry waders and gear and maybe enjoy a glass of wine. Dog-friendly and no minimum stay. Also, this place has a great vibe. Sow's Ear is one cabin up from the river. Our own cabin is one of the closest to the river on the entire Trinity and since our guests have full use of our cabin's riverfront patio, hot tub and more, as well as someone to borrow stuff like tape, or a wrench, or a compressor, or flour from (not to mention a dead battery jump!) you win all the way around. Sow's Ear is a 3 bedroom, 2 bathroom cabin that is priced for up to 6 guests, but it's quite popular for couples, so we have special rates for a party of two using one bed. We will consider a few guests over 6, but try to keep numbers down. If approved, additional guests over a total of six are $16 each per night. You can watch Netflix and Amazon Prime on the SMART TV, and a really good selection of books awaits you. Sow's Ear has Wi-Fi and you can use your cellphone for calling over the internet. Guests get free introductory lessons on SUPs (stand-up paddle boards). We're on a wide and calm stretch of the river that's perfect for learning this sport. 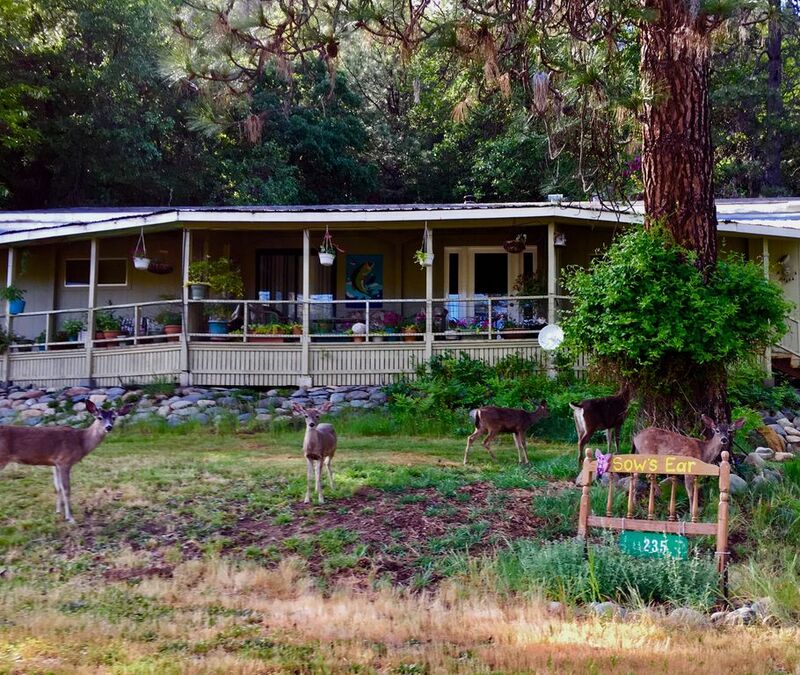 There is excellent hiking right outside your door, and who doesn't enjoy watching the deer that wander through the yard daily? Sow's Ear has a wood stove (wood provided), central heating and air-conditioning, a full laundry (supplies provided) and a well-stocked kitchen. It is just 5 minutes or so off 299, but end-of-the-road quiet, and very easy to reach on fully paved roads. The river is less than a minute's walk down the drive and you have full use of our shady patio overlooking the river complete with lounge chairs, a fire pit and more BBQs (including a Traeger wood pellet model). Guests are encouraged to enjoy our 600+ feet of riverfront, the hammock by the river AND and don't forget that hot tub overlooking the river. The tub is upriver of our cabin and the lawn so guests don't feel crowded and we don't mind if you whoop it up as long as you treat our place with respect. Each bedroom is unique and tastefully furnished. The master bedroom, Honeysuckle, has a custom queen log bed and a sliding door to the large covered porch. The Rustic has a queen-size log bed and a slider to the river porch. You can see and hear the river from the living room, porch and the Rustic bedroom. The Cedar Sanctuary room that looks out on the rosemary garden is completely paneled in cedar tongue & groove. It has a queen bed and adult-sized bunk beds. We have really cool animal sleeping bags for kids. See them in Photos. Depending on the season we may be able to offer a discount for over 3 nights. We also offer a dandy extended stay rate for traveling medical professionals and others who need a home away from home, and we have a couple's rate when only one bedroom is used. Please note the "Average nightly rate" you see is set by VRBO and it is not accurate; our posted rates are. Bringing your own boat(s)? Bucktail put-in is across the river. Sow's Ear has proven to be a very popular cabin for fishers, who can tie their boats off to the trees overnight. Their catarafts are safe on the river bank, or on our lawn. Remember: our shoreline is your shoreline. You can dine overlooking the river, lounge in the chairs and hammock, or fish from the shore. KAYAK~SUP~RAFT! Bring tubes or smaller rafts for playing in front of our cabin. Rent our kayaks and SUPs for lake use, or join us on a guided river trip. Guests often say this trip is the highlight of their vacation. Spring-Fall: We offer top notch sit-on-top kayak lessons, guided trips and rentals; guided raft trips and rentals; and stand-up paddleboard (SUP) demos, lessons and rentals. Our kayak lessons and guided river trips are exceptional. Check out our bio to see why. We are very good at teaching and guiding, never pushing you beyond your comfort zone, yet showing you how to expand it with our help. If you're looking for comfort, peace and very reasonable rates, you're going to love Sow's Ear. Who in their 60s delights in paddling a river in the frigid winter? Or heading out with their chainsaws to cut firewood for their cabins? That would be Steph and Heidi. Steph Dutton is a world-renowned kayaker who paddled from Canada to Mexico, then paddled the Oregon coast again, in the winter. He also circumnavigated California's Channel Islands, often enduring thirty-foot seas. Heidi Tiura owned and ran several businesses before running away to sea and working on tugboats in Alaska, Washington and Oregon. Steph and Heidi are both Coast Guard licensed masters, and creators of Sanctuary Cruises on the Monterey Bay. They have been featured in numerous books and documentaries for their conservation work with whales (including National Geographic's 'Whale Attack,' which was based on their Mother's Day 2004 whale watching cruise). Now, they live on the upper Trinity River and their kayak adventures are of a tamer sort. When not rafting or kayaking with their guests, they can often be found cutting wood or out on their motorcycles, because Trinity County has the best roads for riding bikes, SUPing down the river or skiing (both are PSIA certified ski instructors but they decided it really is more fun to ski rather than teach it). Trinity County has the unbeatable combination of great natural beauty, incredible recreation opportunities, and it hasn't been overrun by tourists. People who have come here for twenty years remark at how little has changed. It is a spectacular place to explore. Being on the river has to be one of the most relaxing things there is up here, but that's not all. Whether you fish, paddle, hike, mountain bike or just sit and watch the fish swim by, it is a wonderful escape. We offer a standard coffee maker as well as a Keurig single-cup brewer with reusable filter holders and paper filters. Nothing goes to landfill! Basic spices, sugar, flour, cooking oil; borrow anything from us! Located upriver from our own cabin, and less than a minute's walk on the paved drive from Sow's Ear, the hot tub overlooks the Trinity River and is a great place for stargazing. Very cute house in a beautiful area! Heidi and Steph were so friendly and accommodating! Definitely recommend staying here if you’re in the area! It was wonderful having Conor & Co with us. Delightful folks and they left the house in beautiful shape. Come back soon! Not only was the house very well kept and fitting for our group, Steph and Heidi were incredibly accommodating and made sure we were as comfortable as can be. They are very friendly people that want to ensure you have the best vacation possible here- which is exactly what happened! There were no surprises with this place and we enjoyed most of our meals on the front porch. We were met with plenty of sleeping options and a cozy atmosphere. The river across the street was very refreshing during the daytime and we enjoyed being able to use the hot tub at night. None of us wanted to leave and we're all already talking about when we'd be able to come back. We loved it there and our only complaint about this vacation was that it had to end! Very cute place and very comfortable! The kitchen was stocked with anything we needed to cook and Heidi and Steph were very friendly, helpful and hospitable. Great place! The Sow’s Ear was a perfect location for our girls getaway. There are eight of us (usually nine) that have known each other for 45+ years and we all got together for a relaxing, catch up on life weekend. The area is perfect for taking a leisurely walk while chatting, sit by the river and become mesmerized, or fall asleep on the porch listening to the sounds of nature all around you. With three bedrooms and two full baths, it was perfect for 8 women. While the kitchen isn’t large, it’s certainly workable with everything we needed for cooking all of our meals. Heidi and Steph are great hosts and welcomed us to the home, showed us where the hot tub and fire pit are, and made sure we knew we could use them at any time (which we did). We decided to rent kayaks from them and they took them to Lewiston Lake where we enjoyed a beautiful day in the sun and on the water. Heidi even did SUP lessons for a couple of us. What a great instructor she was!!! She had them standing up successfully in no time! It was a fantastic weekend for all of us. Thank you Heidi and Steph for making our stay such a pleasant one! Great place. Quite, peaceful, and wonderful. Thanks, Doug! We are really happy knowing you enjoyed your stay and would love having you back. You'll find several cool additions next time because now that we have sold 3 of our vacation cabins, we have more time to baby Sow's Ear. I just added new dinnerware and really attractive stainless, insulated wine glasses but some of the changes will be larger so stay tuned! Very cozy and rustic , perfect for our needs. The setting was very peaceful. Had a great time close enough to trails for mountain biking, hot tub setting was very relaxing on the river in quiet rural neighborhood. Sitting on the front porch with a beer after riding was just what the doctor ordered. The owners were very helpful/informative about the area. Incredible fishing for salmon, steelhead, trout & more; fantastic winter steelhead runs. Year-round Ocean Kayak sit-on-top kayak lessons, demos, sales, rentals and guided river or lake trips; raft rentals, or guided river or lake trips. Great for fishing, birding and parties with smaller kids and big dogs. We cater to chickens. Please contact us for discounts on stays over 2 nights. We offer exceptionally generous discounts on longer stays, especially for medical travelers coming to work in the area. If approved, additional guests might be increased with additional fees. Pet Fees are per dog ($15 each). Friendly dogs ONLY. We will consider more than 1 dog and may even waive the fee for a 2nd dog, but we absolutely need an accurate count. Guests who book directly with us do not pay until they arrive. Guided Kayak Trips include full lesson, all gear, shuttles. Guided raft trips include all gear necessary and shuttles. Free paddleboard mini-lessons are available.